Do you use Project life or Picture my life (CTMH version) for pocket style scrapbooking? If you don't scrapbook pocket style, do you use the cards for traditional scrapbooking or even cards? I DO! I love it- I really do. A quick little card can add a little style to any project. The problem is, all these little cards need someplace to go. I decided to research what others do and realized I have just the solution at my fingertips! 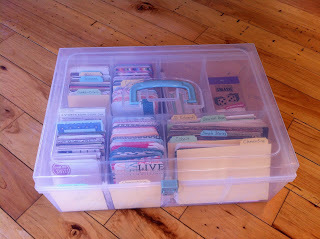 The medium organizer by CTMH is perfect for storing all of my little cards. I just ordered 1 (ok... 2!) to organize all of my cards. If you're looking at this like... why didn't I think of that? You can click here to find out more about these organizers. If you're thinking... Picture my Life cards? what are those? You can click here to see our current designs. BONUS: If after reading this post you decide to place an order for the medium organizer and any 1 Picture My Life kit- I'll mail you an assortment of 25 PML cards in a variety of themes to build your stash. (valid June 23- midnight EST on June 30). The PML cards will arrive separately within 1-2 weeks. What is pocket style scrapbooking? Am I that out of the loop?! It's a style of scrapbooking where you slide photos into pockets. You can also use pre-cut pieces that fit the pockets to add embellishments, journaling etc. I'll do a blog post on this soon.